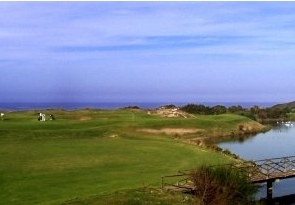 Situated near a lively summer resort, Póvoa de Varzim, and only 30 minutes from Oporto's Francisco Sá Carneiro international airport, the Estela course was inaugurated in January 1989. Designed by the Portuguese architect Duarte Sottomayor, the course is a typical links following the Scottish tradition, but with one difference: Bermuda grass. 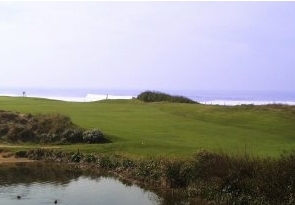 Built over three kilometres of beautiful dunes on the Costa Verde, it provides breathtaking views over the Atlantic. 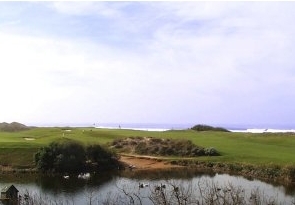 Two big lakes add to the beauty of the course, which can become quite challenging when the wind is blowing. Inaccurate drives will be punished by landing in the sand-dunes, and on almost every occasion a ball lands off the fairway there is little chance of reaching the green with a second shot. 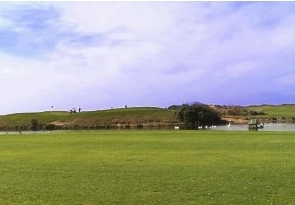 Despite being one of the newest golf courses, it has already hosted two events in the European Professionals' Circuit. In 1990 the Atlântico/Vinho Verde Cup was won by the Scot Stephen McAllister, in a play-off that involved seven players. 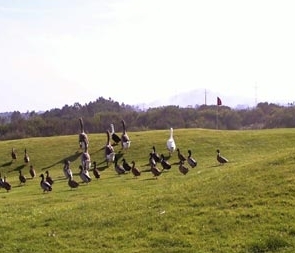 In 1991 it hosted the Portuguese Open, in which the Briton Steven Richardson triumphed and more recently was chosen for the European International Amateur Championships. Estela Driving Directions - Take the IC-1 from Porto and turn right to Estela after Póvoa de Varzim Exit. Pass back under the IC-1 and head west towards the coast. At the EN 13 turn left and drive south you will find shortly direction signs to turn right to the course.